The Champion Sports Plastic Scooters with Handles promote balance, strength and creativity in a fun recreational activity. Use in a seated, kneeling, or prone position, play scooter hockey, or create a scooter train! 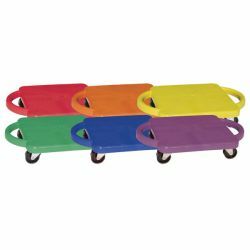 This set of six 12" plastic scooters feature easy grip handles and non-marring swivel casters, and come in a rainbow of vivid colors.